The family of Lorenzo Hayes, who died in the Spokane County Jail in 2015, is still fighting for reforms. Angelique Sam stands on the steps of the Spokane County Courthouse and tells the crowd of just under 100 people that she once was a drug addict thrown into a Spokane County Jail cell. Her daughter stands next to her as she speaks. The young girl holds a sign that reads "Custody ≠ Death" and "#NotOneMore," a rallying cry of this group demanding that no more people die inside the jail. 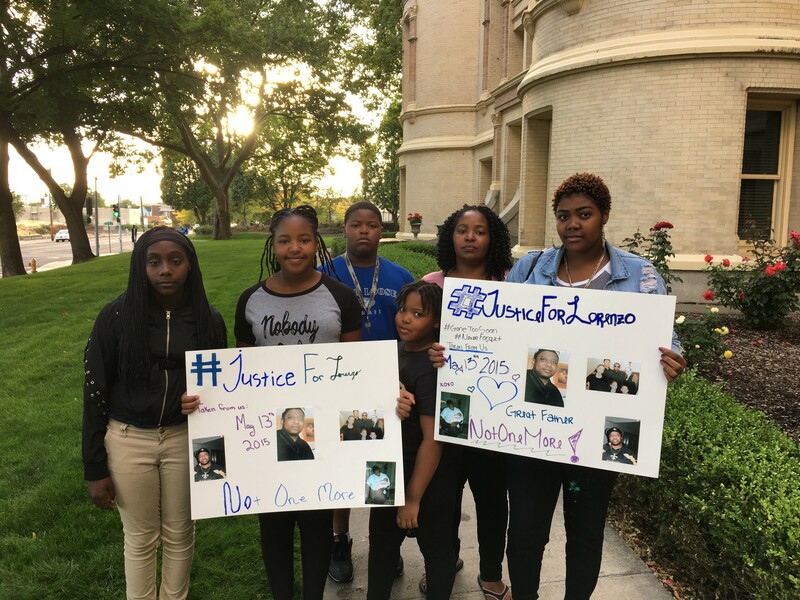 The group of families, activists and community leaders have gathered to protest the recent deaths inside the county's lockup — a total of eight in the past 14 months. The most recent was a woman, who died in late August. Many of the deaths are suspected to be related to complications from drugs or alcohol. Three men hanged themselves in their cells. The demonstration was organized by several local organizations including the Spokane County Human Rights Task Force, the Center for Justice, Planned Parenthood's Raiz program the Peace and Justice Action League, the Ministerial Fellow of Spokane and others. Sam tells the crowd that she knows how some of those people must have felt. Now in recovery, the 46-year-old was once left to detox from an opioid addiction on her own in a cell. She says she didn't tell jail staff because she feared repercussions. Drug and mental health treatment inside local jails has been an issue for facilities across the state and throughout the country. Medication-assisted treatment for opioid addiction and withdrawal — widely considered the standard of care among physicians — is becoming more accepted among jail administrators. A study from the University of Washington indicates that more than half of the people addicted to opioids in Washington will pass through a jail door in a given year. "The numbers showed us that the jails are the epicenter of the opioid crisis," says Marc Stern, one of the UW researchers. "So in some ways, the jail is unfortunately the perfect place to address this problem. It's where you can change behaviors and turn someone's life around." Through a partnership with the Spokane Regional Health District, the Spokane County Detention Services has established a methadone program for those booked into jail. Methadone is one of the three medications approved to treat opioid dependency. Recently, the jail's medical provider, NaphCare, added the drug buprenorphine to its treatment plan, which can dramatically reduce the impact of drug opioid withdrawal. But the people gathered in front of the courthouse — especially the families of those who have died in the jail — are calling for changes beyond drug treatment. Monica Moore, the cousin of Lorenzo Hayes, who died in the jail in May 2015, speaks after Sam. Hayes was one of five people to die in the jail that year. His death was ruled a homicide by the Spokane medical examiner, though no law enforcement or jail officers have been charged. Hayes reportedly choked to death on his own vomit. Moore tells the crowd that she wishes the deaths would have stopped with Hayes. "These are people," she says. "These are human beings who are not being treated accordingly because they are deemed as less-than." In a separate interview with the Inlander, Moore describes watching surveillance footage of Hayes being booked into jail. She describes watching officers drag him from the patrol car into the jail's booking area. "You should watch that video and see how long it took for medical treatment to get to him," Moore says. "The inhumane way he was treated, nobody should ever be treated like that. I can imagine how many people who have come in here and have been in some sort of medical distress and they've been dismissed or treated as if they're not priority and that needs to stop." Darla Sawyers and Shannon Griffiths, the mother and sister of Patrick Flynn, who was suffering from withdrawals when he hanged himself in a cell this past May, were also at the rally, along with Flynn's 10-year-old son Jackson. Sawyers echoes Moore's call for better treatment of inmates and better training for corrections officers. She says she wants to arrange a group of families whose loved ones have died in the jail, and to talk with the county commissioners about what changes need to be made. "They don't treat them like human beings," says Sawyers, who is a retired corrections officer with the Department of Corrections. "They treat them like they're already guilty. The jail is there to protect them, contain them and to keep them safe. That's their job, and they're slipping up."